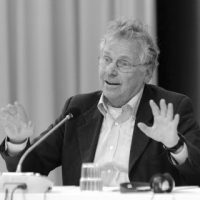 Daniel Cohn-Bendit was a member of the European Parliament from 1994 until 2014, representing both the German and French Green delegations in rotation. The right to asylum is not a numbers game, it is a human right. Das Recht auf Asyl ist kein Zahlenspiel, es ist ein Menschenrecht. Le droit à l'asile n'est pas un jeu de chiffres, c'est un droit humain. La « radicalité démocratique » comme élément constitutif du projet écologiste. Depuis le 15 septembre 2008, nous sommes engagés dans une bataille dont l’issue déterminera le sort de l’Europe et des Européens pour la durée de ce siècle. Les forces conjuguées de la technocratie néolibérale, froide et austère, et des populismes réactionnaires et haineux nous entraînent vers l’abîme. If There Is No Alternative, There Is No Democracy! The neo-liberal Taliban have brought Europe to its knees. For the first time in its history, the European idea has been weakened to the point that its survival is now at risk. In this proposal, initiated by Ulrick Bech and Daniel Cohn-Bendit, a group of pro-Europeans argue for a form of active citizenship to promote European democracy and resolve the political crisis that continues to grip the European project. This afternoon whilst strolling in the university gardens I had a most extraordinary, if not hallucinatory, encounter!